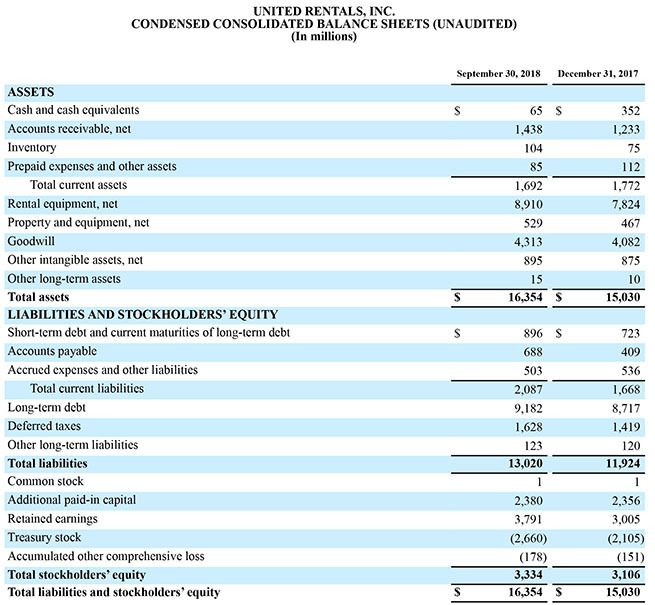 United Rentals, Inc. (NYSE : URI) today announced financial results for the third quarter 20181. Total revenue was $2.116 billion and rental revenue was $1.861 billion for the third quarter, compared with $1.766 billion and $1.536 billion, respectively, for the same period last year. 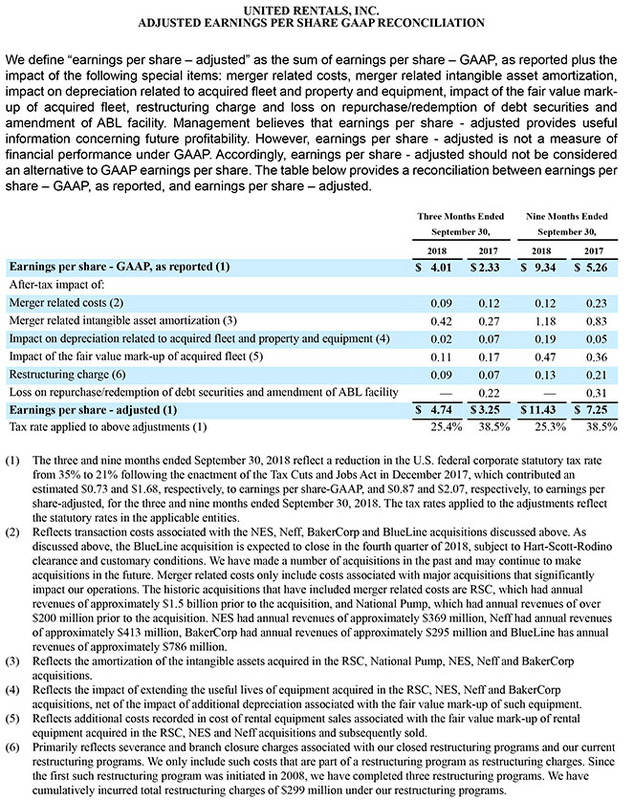 On a GAAP basis, the company reported third quarter net income of $333 million, or $4.01 per diluted share, compared with $199 million, or $2.33 per diluted share, for the same period last year. The third quarter 2018 includes a net income benefit associated with the Tax Cuts and Jobs Act (the “Tax Act”) that was enacted in December 2017. The Tax Act reduced the U.S. federal corporate statutory tax rate from 35% to 21%, which contributed an estimated $0.73 to earnings per diluted share for the third quarter 20182. 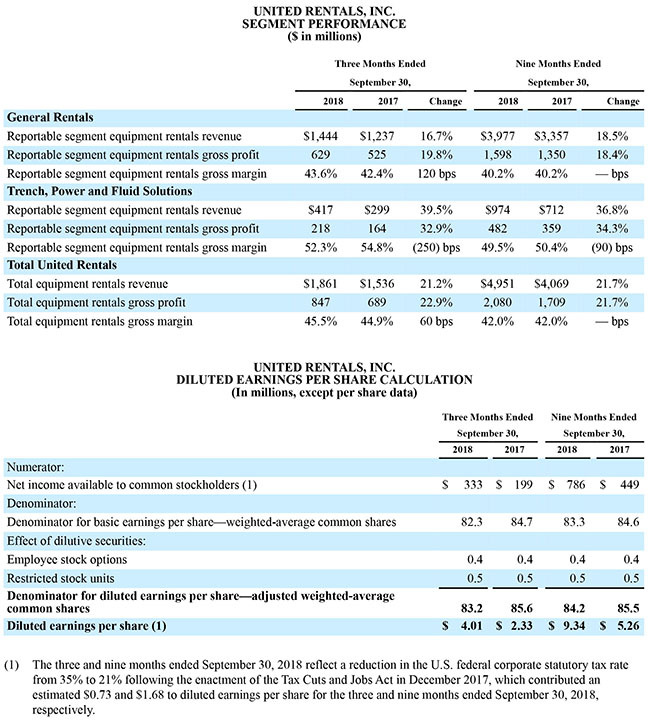 Adjusted EPS3 for the quarter was $4.74 per diluted share, compared with $3.25 per diluted share for the same period last year. The reduction in the tax rate discussed above contributed an estimated $0.87 to adjusted EPS for the third quarter 20182. Adjusted EBITDA3 was $1.059 billion and adjusted EBITDA margin3 was 50.0%, reflecting increases of $180 million and 20 basis points, respectively, from the same period last year. Excluding the impact of the BakerCorp acquisition, adjusted EBITDA margin improved 80 basis points year-over-year to a record of 50.6%. Rental revenue4 increased 21.2% year-over-year. Owned equipment rental revenue increased 20.3%, reflecting increases of 17.8% in the volume of equipment on rent and 2.1% in rental rates. Pro forma1 rental revenue increased 10.9% year-over-year, reflecting growth of 7.4% in the volume of equipment on rent and a 2.1% increase in rental rates. Time utilization decreased 100 basis points year-over-year to 70.9%, primarily reflecting the impact of the Neff and BakerCorp acquisitions. On a pro forma basis, time utilization decreased 10 basis points year-over-year to 70.7%. For the company’s specialty segment, Trench, Power and Fluid Solutions, rental revenue increased by 39.5% year-over-year, including a 12.7% increase on a same store basis. Rental gross margin decreased by 250 basis points to 52.3%. The decrease in rental gross margin was primarily due to the impact of the BakerCorp acquisition and an increase in lower-margin fuel revenues primarily within the Power and HVAC region1. The company completed the acquisitions of NES Rentals Holdings II, Inc. (“NES”), Neff Corporation ("Neff") and BakerCorp International Holdings, Inc. (“BakerCorp”) in April 2017, October 2017, and July 2018, respectively. The acquisitions are included in the company's results subsequent to the acquisition dates. Pro forma results reflect the combination of United Rentals, NES, Neff and BakerCorp for all periods presented. The acquired BakerCorp locations are reflected in the Trench, Power and Fluid Solutions specialty segment. The name of the specialty segment was changed (formerly "Trench, Power and Pump") to reflect the broader product offering following the BakerCorp acquisition. The estimated contribution of the Tax Act was calculated by applying the percentage point tax rate reduction to U.S. pretax income and the pretax adjustments reflected in adjusted EPS. 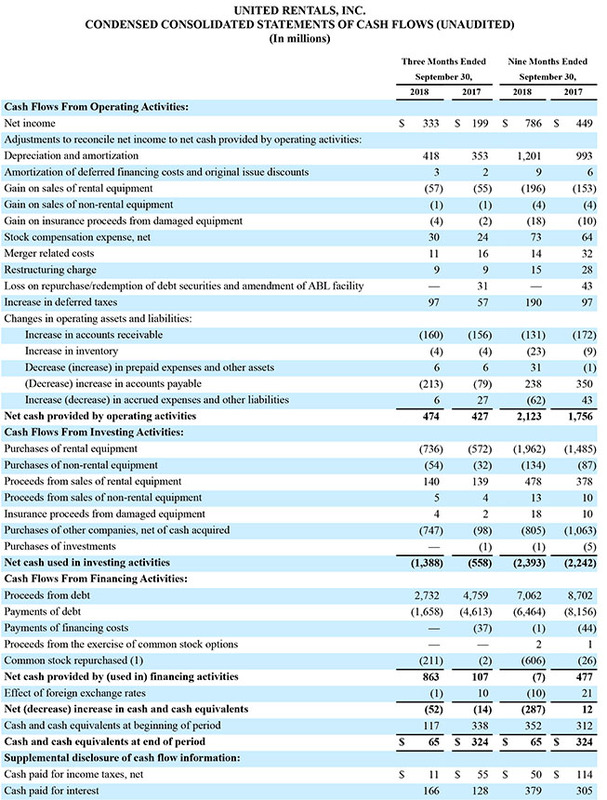 The company generated $140 million of proceeds from used equipment sales at a GAAP gross margin of 40.7% and an adjusted gross margin of 50.0%, compared with $139 million at a GAAP gross margin of 39.6% and an adjusted gross margin of 56.8% for the same period last year. The year-over-year decrease in adjusted gross margin was primarily due to the impact of selling more fully depreciated fleet acquired in the NES acquisition in the third quarter 20175. On 10 septembre 2018, the company announced that it has entered into a definitive agreement to acquire Vander Holding Corporation and its subsidiaries (“BlueLine”) for approximately $2.1 billion in cash. The company expects to fund the acquisition using a new $1 billion term loan facility and other debt issuances. BlueLine is one of the ten largest equipment rental companies in North America, serves over 50,000 customers in the construction and industrial sectors, and has 114 locations and over 1,700 employees based in 25 U.S. states, Canada and Puerto Rico. BlueLine has annual revenues of approximately $786 million. The transaction is expected to close in the fourth quarter, subject to Hart-Scott-Rodino clearance and other customary conditions. Michael Kneeland, chief executive officer of United Rentals, said, "We are pleased with the strength of our third quarter results, including the acceleration in volume growth and improved margins. Our rates were again positive for each month in a competitive market, while time utilization remained robust. We continue to make good progress integrating Baker into our specialty operations, and look forward to beginning that process with BlueLine this quarter." Kneeland continued, "Our updated guidance reflects the combination of strong market demand and the contributions from our completed acquisitions, which, together with internal and external indicators, point to a solid fourth quarter and healthy momentum into 2019. Our strategy remains highly focused on driving profitable growth across our core businesses, integrating our recent acquisitions and leveraging our cash flows to maximize shareholder value." Rental revenue increased 21.7% year-over-year. Owned equipment rental revenue increased 21.4%, reflecting increases of 19.6% in the volume of equipment on rent and 2.3% in rental rates. Pro forma rental revenue increased 11.0% year-over-year, reflecting growth of 7.3% in the volume of equipment on rent and a 2.4% increase in rental rates. Time utilization decreased 80 basis points year-over-year to 68.5%, primarily reflecting the impact of the NES, Neff and BakerCorp acquisitions. On a pro forma basis, time utilization increased 20 basis points year-over-year to 68.2%. For the company’s specialty segment, Trench, Power and Fluid Solutions, rental revenue increased by 36.8% year-over-year, including a 19.1% increase on a same store basis. Rental gross margin decreased by 90 basis points to 49.5%. The decrease in rental gross margin was primarily due to the impact of the BakerCorp acquisition. Used equipment sales adjusted gross margin excludes the impact of the fair value mark-up of acquired RSC, NES and Neff fleet that was sold. In 2018, we adopted Accounting Standards Codification (“ASC”) Topic 606, “Revenue from Contracts with Customers”. Used equipment sales in the third quarter of 2017 would have been reduced by $14 million under Topic 606 because such sales would have been recognized prior to the third quarter. The amount of used equipment sales recognized for the nine months ended September 30, 2017 does not differ materially from the amount that would have been recognized under Topic 606. While the adoption of Topic 606 impacted the timing of revenue recognition, it has no impact on annual revenue. For the first nine months of 2018, net cash provided by operating activities was $2.123 billion, and free cash flow was $536 million after total rental and non-rental gross capital expenditures of $2.096 billion. For the first nine months of 2017, net cash provided by operating activities was $1.756 billion, and free cash flow was $582 million after total rental and non-rental gross capital expenditures of $1.572 billion. Free cash flow for the first nine months of 2018 and 2017 included aggregate merger and restructuring related payments of $32 million and $52 million, respectively. The size of the rental fleet was $12.90 billion of OEC at September 30, 2018, compared with $11.51 billion at 31 décembre 2017. The age of the rental fleet was 46.6 months on an OEC-weighted basis at September 30, 2018, compared with 47.0 months at 31 décembre 2017. ROIC was 10.7% for the 12 months ended September 30, 2018, compared with 8.6% for the 12 months ended September 30, 2017. 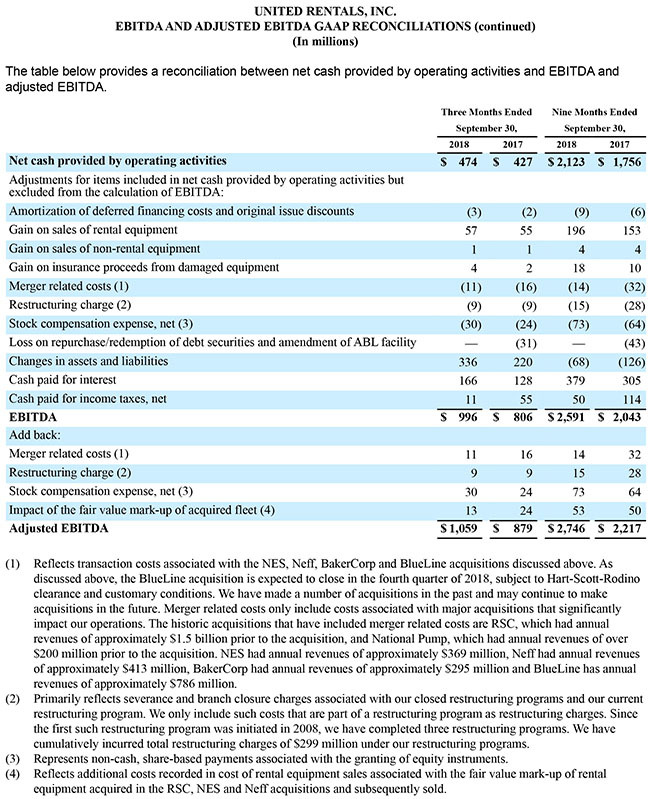 The company’s ROIC metric uses after-tax operating income for the trailing 12 months divided by average stockholders’ equity, debt and deferred taxes, net of average cash. To mitigate the volatility related to fluctuations in the company’s tax rate from period to period, the U.S. federal corporate statutory tax rates of 21% and 35% for 2018 and 2017, respectively, were used to calculate after-tax operating income. The company expects ROIC to materially increase due to the reduced tax rates following the enactment of the Tax Act, but, because the trailing 12 months are used for the ROIC calculation, the full impact will not be reflected until one year after the lower tax rate became effective. If the 21% U.S. federal corporate statutory tax rate following the enactment of the Tax Act was applied to ROIC for all historic periods, the company estimates that ROIC would have been 11.0% and 10.3% for the 12 months ended September 30, 2018 and 2017, respectively. In July 2018, the company commenced its previously announced $1.25 billion share repurchase program. As of September 30, 2018, the company has repurchased $210 million of common stock under the program. The company expects to pause repurchases under the program following the completion of the pending BlueLine acquisition discussed above. The company intends to complete the share repurchase program; however, it will continue to evaluate its decision to do so as it integrates BlueLine. United Rentals will hold a conference call tomorrow, Thursday, October 18, 2018, at 11:00 a.m. Eastern Time. The conference call number is 855-458-4217 (international: 574-990-3618). The conference call will also be available live by audio webcast at unitedrentals.com, where it will be archived until the next earnings call. The replay number for the call is 404-537-3406, passcode is 3484139. 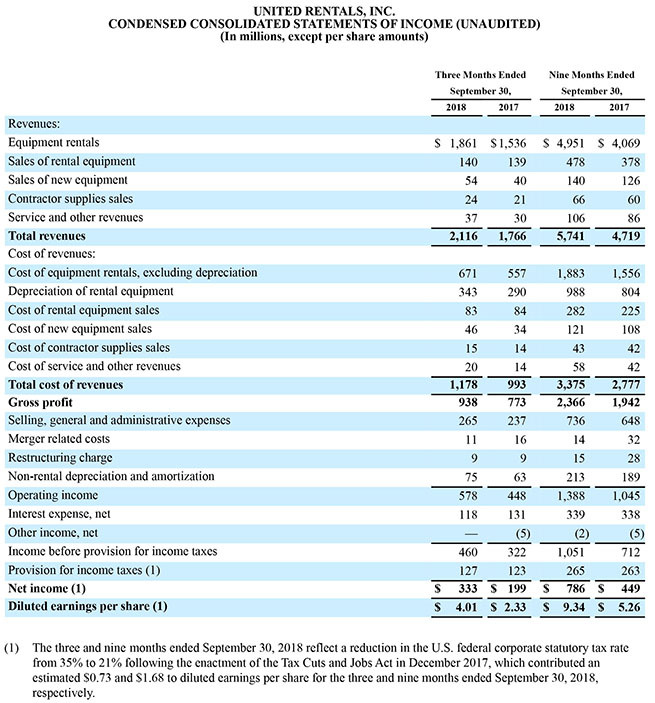 Free cash flow, earnings before interest, taxes, depreciation and amortization (EBITDA), adjusted EBITDA, and adjusted earnings per share (adjusted EPS) are non-GAAP financial measures as defined under the rules of the SEC. 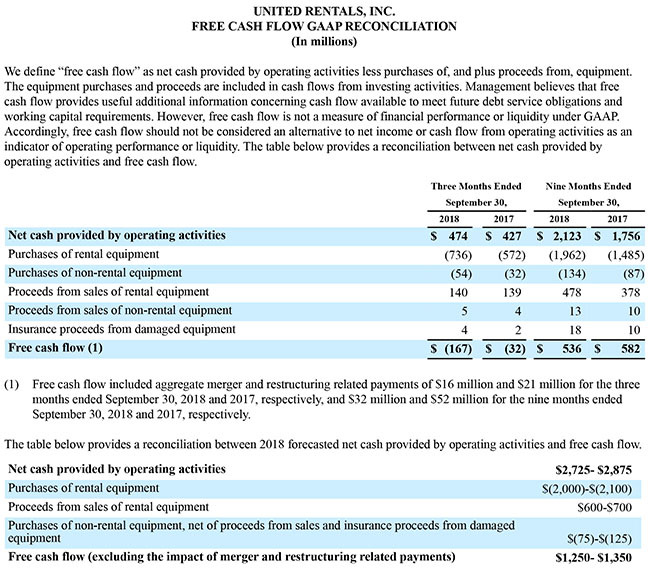 Free cash flow represents net cash provided by operating activities less purchases of, and plus proceeds from, equipment. The equipment purchases and proceeds represent cash flows from investing activities. EBITDA represents the sum of net income, provision for income taxes, interest expense, net, depreciation of rental equipment and non-rental depreciation and amortization. 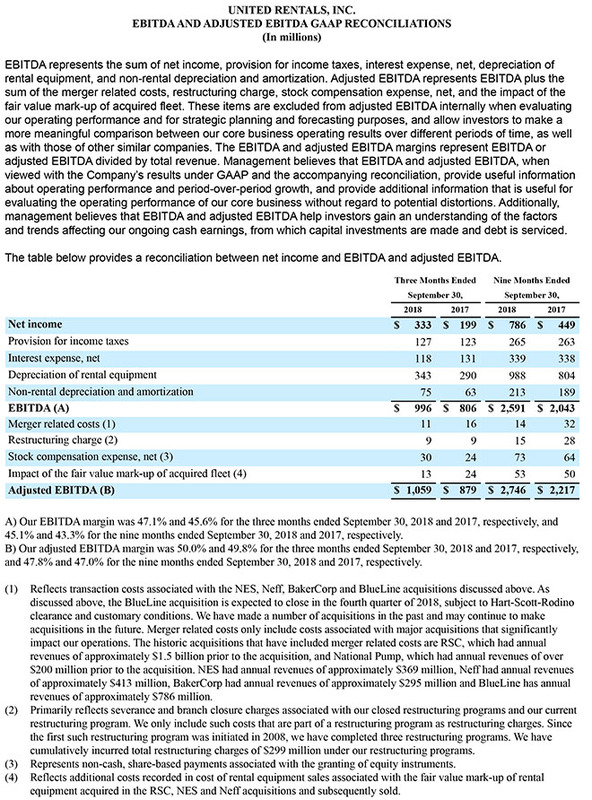 Adjusted EBITDA represents EBITDA plus the sum of the merger related costs, restructuring charge, stock compensation expense, net, and the impact of the fair value mark-up of acquired fleet. Adjusted EPS represents EPS plus the sum of the merger related costs, restructuring charge, the impact on depreciation related to acquired fleet and property and equipment, the impact of the fair value mark-up of acquired fleet, the loss on repurchase/redemption of debt securities and amendment of ABL facility, and merger related intangible asset amortization. The company believes that: (i) free cash flow provides useful additional information concerning cash flow available to meet future debt service obligations and working capital requirements; (ii) EBITDA and adjusted EBITDA provide useful information about operating performance and period-over-period growth, and help investors gain an understanding of the factors and trends affecting our ongoing cash earnings, from which capital investments are made and debt is serviced; and (iii) adjusted EPS provides useful information concerning future profitability. However, none of these measures should be considered as alternatives to net income, cash flows from operating activities or earnings per share under GAAP as indicators of operating performance or liquidity. United Rentals, Inc. est la plus importante entreprise de location d’équipement au monde. The company has an integrated network of 1,075 rental locations in North America and 11 in Europe. In North America, the company operates in 49 states and every Canadian province. The company’s approximately 16,700 employees serve construction and industrial customers, utilities, municipalities, homeowners and others. The company offers approximately 3,800 classes of equipment for rent with a total original cost of $12.90 billion. United Rentals est un membre de l’indice Standard & Poor’s 500, de l’indice de confiance Barron 400 et du Russel 3000 Index®, et est basé à Stamford, Conn. Vous trouverez d’autres renseignements sur United Rentals sur le site unitedrentals.com. This press release contains forward-looking statements within the meaning of Section 21E of the Securities Exchange Act of 1934, as amended, and the Private Securities Litigation Reform Act of 1995, known as the PSLRA. These statements can generally be identified by the use of forward-looking terminology such as “believe,” “expect,” “may,” “will,” “should,” “seek,” “on-track,” “plan,” “project,” “forecast,” “intend” or “anticipate,” or the negative thereof or comparable terminology, or by discussions of vision, strategy or outlook. These statements are based on current plans, estimates and projections, and, therefore, you should not place undue reliance on them. No forward-looking statement can be guaranteed, and actual results may differ materially from those projected. Factors that could cause actual results to differ materially from those projected include, but are not limited to, the following: (1) the challenges associated with past or future acquisitions, including NES, Neff, BakerCorp and the proposed BlueLine acquisition, such as undiscovered liabilities, costs, integration issues and/or the inability to achieve the cost and revenue synergies expected; (2) the risk that the proposed BlueLine acquisition may not be completed; (3) a slowdown in North American construction and industrial activities, which could reduce our revenues and profitability; (4) our significant indebtedness, which requires us to use a substantial portion of our cash flow for debt service and can constrain our flexibility in responding to unanticipated or adverse business conditions; (5) the inability to refinance our indebtedness at terms that are favorable to us, or at all; (6) the incurrence of additional debt, which could exacerbate the risks associated with our current level of indebtedness; (7) noncompliance with covenants in our debt agreements, which could result in termination of our credit facilities and acceleration of outstanding borrowings; (8) restrictive covenants and amount of borrowings permitted under our debt agreements, which could limit our financial and operational flexibility; (9) an overcapacity of fleet in the equipment rental industry; (10) a decrease in levels of infrastructure spending, including lower than expected government funding for construction projects; (11) fluctuations in the price of our common stock and inability to complete stock repurchases in the time frame and/or on the terms anticipated; (12) our rates and time utilization being less than anticipated; (13) our inability to manage credit risk adequately or to collect on contracts with customers; (14) our inability to access the capital that our business or growth plans may require; (15) the incurrence of impairment charges; (16) trends in oil and natural gas could adversely affect demand for our services and products; (17) our dependence on distributions from subsidiaries as a result of our holding company structure and the fact that such distributions could be limited by contractual or legal restrictions; (18) an increase in our loss reserves to address business operations or other claims and any claims that exceed our established levels of reserves; (19) the incurrence of additional costs and expenses (including indemnification obligations) in connection with litigation, regulatory or investigatory matters; (20) the outcome or other potential consequences of litigation and other claims and regulatory matters relating to our business, including certain claims that our insurance may not cover; (21) the effect that certain provisions in our charter and certain debt agreements and our significant indebtedness may have of making more difficult or otherwise discouraging, delaying or deterring a takeover or other change of control of us; (22) management turnover and inability to attract and retain key personnel; (23) our costs being more than anticipated and/or the inability to realize expected savings in the amounts or time frames planned; (24) our dependence on key suppliers to obtain equipment and other supplies for our business on acceptable terms; (25) our inability to sell our new or used fleet in the amounts, or at the prices, we expect; (26) competition from existing and new competitors; (27) security breaches, cybersecurity attacks and other significant disruptions in our information technology systems; (28) the costs of complying with environmental, safety and foreign laws and regulations, as well as other risks associated with non-U.S. operations, including currency exchange risk; (29) labor difficulties and labor-based legislation affecting our labor relations and operations generally; (30) increases in our maintenance and replacement costs and/or decreases in the residual value of our equipment; and (31) the effect of changes in tax law, such as the effect of the Tax Cuts and Jobs Act that was enacted on 22 décembre 2017. For a more complete description of these and other possible risks and uncertainties, please refer to our Annual Report on Form 10-K for the year ended 31 décembre 2017, as well as to our subsequent filings with the SEC. The forward-looking statements contained herein speak only as of the date hereof, and we make no commitment to update or publicly release any revisions to forward-looking statements in order to reflect new information or subsequent events, circumstances or changes in expectations.